There have been mixed feelings about this offering on the Internet so far (always the way). I Personally get the value of game pass for anyone getting a new console and wanting to boost their game collection for a set amount of months.But currently (and I'm sure other long-time gamers will feel this way) the service needs to offer way more new titles before it becomes a must buy subscription. While the service does have big hits like Gears 4 and Halo 5 on it already, the rest are games that only get downloaded to test out and forgotten about instantly. 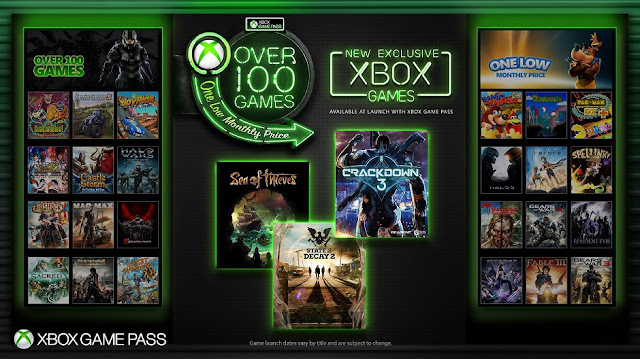 While MS plans to offer their titles, I can't see many other publishers wanting to do the same with recent releases on this service, with the likes of Ubisoft and Activision surely watching how things are going right now and waiting for the right time to drop their own service. We will also get to the point where we start to think enough is enough for a sub based services, as the average gamer is already sitting on Xbox Live Gold, EA Access, and not forgetting the countless movie/sports based streaming services that are used daily on consoles these days. They all add up, and before you know it you can have quite a large sum of money going out of your bank account with these. What are your thoughts on MS doing this? Are you glad you will get to play Sea Of Thieves this year, or do you plan on sticking with your game rental service that offers exactly the same service but with way more games on offer for around the same price? I agree with you, mixed feelings. There are Pros and cons, like you said. Can't see me picking it up any time soon. I have so much to play, that anything on Gamepass just ends up sitting there until the time runs done on it. I disagree, the price alone makes this as one of the best deals I gaming. When new games are released, you can get a subscription for one or two months and cancel it if you feel like you no longer need it. That alone would be a lot cheaper than buying new games as they come out. It's certainly a great deal, especially for newcomers to the platform. I was just speaking for myself and the situation I'm in. I have so much to play across Xbox and Switch that the pass would sit unused. Much of the pass, I already own or have played, and I'm not that interested in others (Racing and Sports). It's a good option especially if you have kids but, right now, it ain't for me. That might change in the future though, as new games are available.